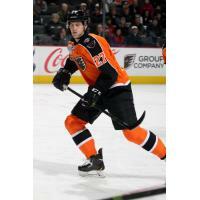 Lehigh Valley, PA - The Lehigh Valley Phantoms, proud AHL affiliate of the Philadelphia Flyers, have signed defenseman Adam Comrie to a PTO (professional try-out). A 27-year-old blueliner from Ottawa, Comrie is in the midst of his eighth professional season and has already tallied a goal, two assists and three points in three games with the Reading Royals of the ECHL. He spent the majority of last season with the Syracuse Crunch where he recorded eight goals, 11 assists and 19 points across 55 games. Comrie spent time with the Phantoms during both the 2014-15 and 2015-16 seasons where he compiled 14 goals, 19 assists and 33 points in 72 games with Lehigh Valley. Across 251 career AHL outings, the 6'4", 219-pound defender has registered 28 goals, 63 assists and 91 total points in time with the Phantoms, Crunch, Rochester American and Worcester Sharks. The Phantoms are back in action tonight when the team travels up to Binghamton for a 7:05 p.m. clash with the Devils. The Phantoms are coming off an incredibly successful third campaign in the Lehigh Valley playing at the state-of-the-art PPL Center in which the team posted its highest win total (48) and highest standings point total (101) in more than a decade. Established in 1996, the Phantoms spent their first 13 seasons at the Spectrum in Philadelphia before re-locating to Glens Falls, New York in 2009 where the team spent the next five seasons as the Adirondack Phantoms. A new era of Phantoms hockey began in the fall of 2014 when the Lehigh Valley Phantoms began play at the state-of-the-art PPL Center. Through 21 incredibly successful campaigns, the Phantoms have qualified for the Calder Cup Playoffs 11 times and have captured two Calder Cup Championships (1998, 2005), two Conference Championships (1998, 2005), two Regular Season Titles (1996-97, 1997-98) and four Division Championships (1996-97, 1997-98, 1998-99, 2003-04).